Oops, sorry! 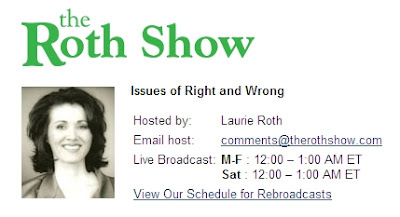 I should have let folks know I'm having a radio interview this afternoon (ahem -- actually at 4 pm Pacific time, about ten minutes after I post this) with the Roth Show with host Laurie Roth. Should have mentioned it sooner! It should be a fairly long interview, though, so hopefully some folks can tune in. Wonder if they will have the interview on website to revisit since missed the interview.